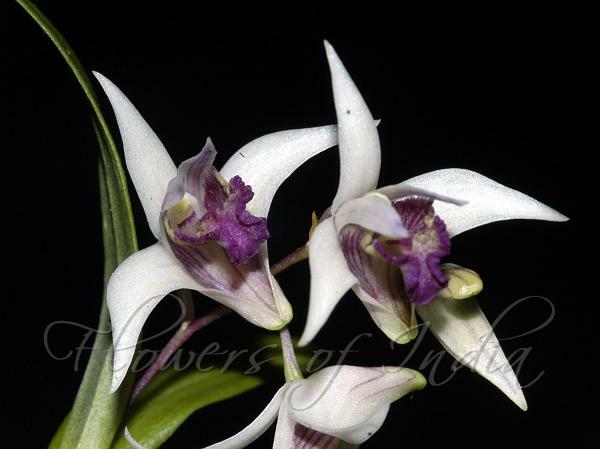 Mountain Dendrobium is a mini-miniature sized, cool to cold growing orchid growing on rocks, with clustered, tapering to the tip pseudobulbs carrying 2-4, apical, thinly leathery, linear-lanceshaped, tapering, apically bilobed leaves. The plant blooms in 3-8 flowered clusters a at branch-ends, erect, slender, 5-15 cm long, Flower-stalk and ovary are about 5 mm, slender. Flowers are spreading, white, lateral lobes of lip with purplish red stripes, disk white with purplish red stripes, column foot with purplish red spots. Dorsal sepal is narrowly oblong, 7-9 × 1.5-1.8 (or more) mm; lateral sepals curved-lanceshaped, 7-9 × about 3.5 mm. Petals are narrowly oblong, 6-8 x about 1.8 mm, tapering; lip nearly elliptic, 5.5-6.5 × 3.5-4.5 (or more) mm, 3-lobed above middle. 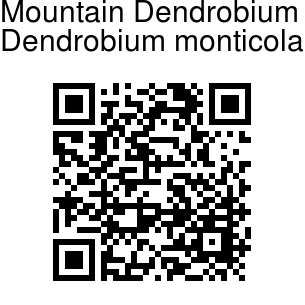 Mountain Dendrobium is found in the Himalayas, from Garhwal to Nepal, at altitudes of 2400-2700 m.